Five case studies of inexpensive, straight-forward improvements possible on city streets and sidewalks. 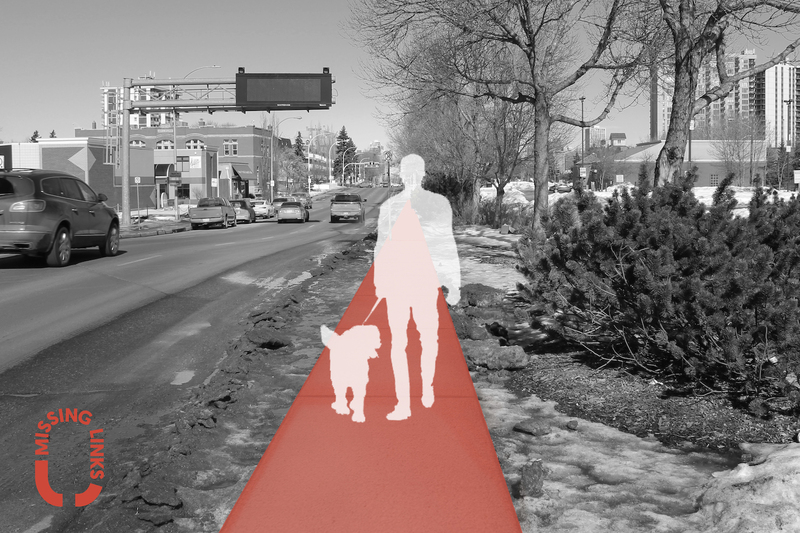 These examples were chosen from more than 200 issues submitted by Edmontonians identifying gaps in sidewalks, crosswalks and bike routes, via our Missing Links initiative [view the map]. Traffic engineer Marcel Huculak developed project outlines and costs for each of the five case study locations. An exhibition of these five images is in the Jobber Art Hole window along Jasper Avenue until May 9, 2019. 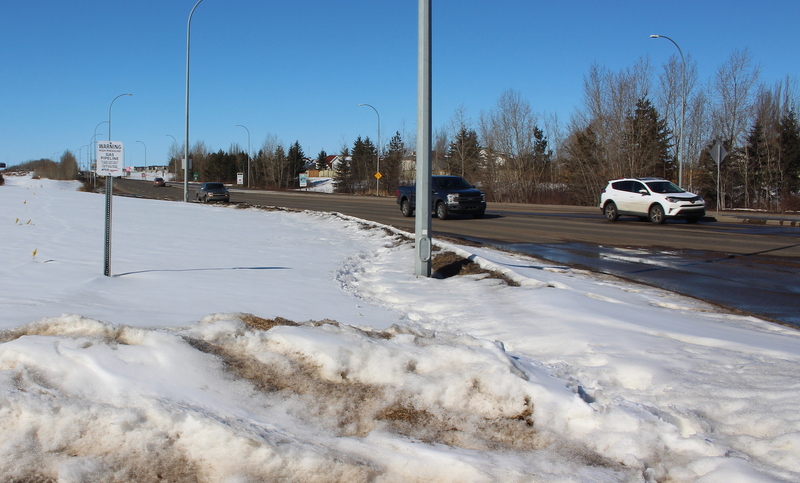 There is no sidewalk between corner of Lewis Estate Boulevard/Whitemud Drive and Whitemud Drive/Winterburn Road. For a “follow the roads” option, install a sidewalk alongside the roadway. To connect from the Funicular to downtown, the 140 metre distance begins at the top of McDougall Hill at approximately 4.5 metres wide. As the walk proceeds north it narrows to about 3 metres wide at the Hotel MacDonald, and this width is further constrained by poles. It crosses the two one-way driveways for the Hotel MacDonald. Then the walk appears wider but has trees, utilities and other street furniture. The surface from the Funicular to the walk beside MacDougall Hill Road is concrete. Beside the road the surface changes to mostly red brick pavers, and continues to Jasper Avenue. The varying route widths, surfaces and intersecting infrastructure makes this an unsafe route for all users. As McDougall Hill Road reaches the top near the Funicular it’s wide to accommodate the reversible lane and its nearby transition from 3 to 4 lanes. Along the northbound lanes the road widens, which also causes the sidewalk to narrow. The road widening does not facilitate the reversible lane transition as the northbound lane does not shift into this widening. 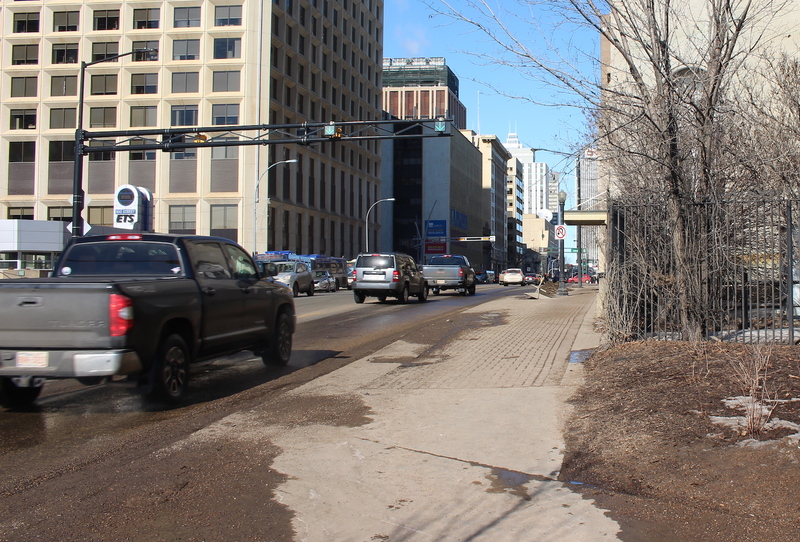 Therefore this widening could be incorporated into a widened sidewalk through to the second Hotel MacDonald access. 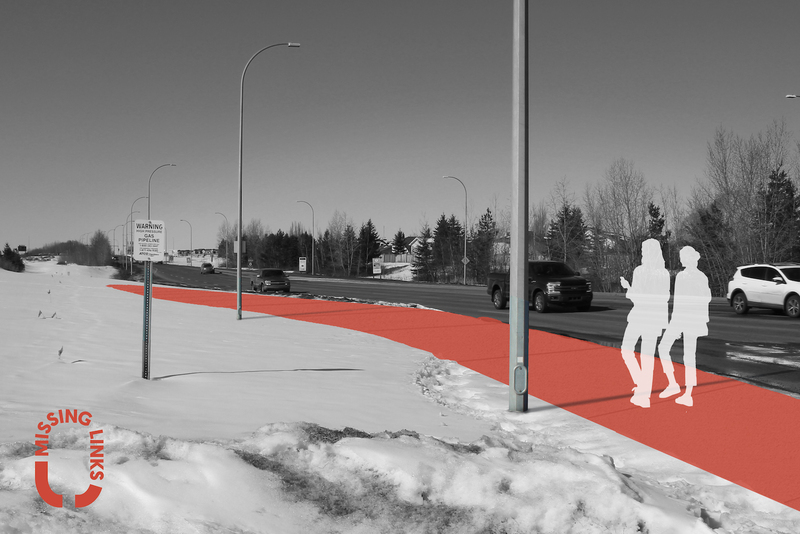 The 159 Avenue roadway is about 14 metres wide, enough for four travel lanes. This is a dangerous situation if a car stops for a pedestrian, making it difficult for any following vehicles to see pedestrians crossing the road. The posted speed limit at the crossing varies by time of day. It is a playground zone (30 km/h) between 07:30 and 21:00 everyday, outside these hours it’s 50 km/h. Put up crosswalk signs and paint crosswalk markings. To address the passing behaviour, install mini-barriers at the crossing to narrow the road to only one lane in each direction. 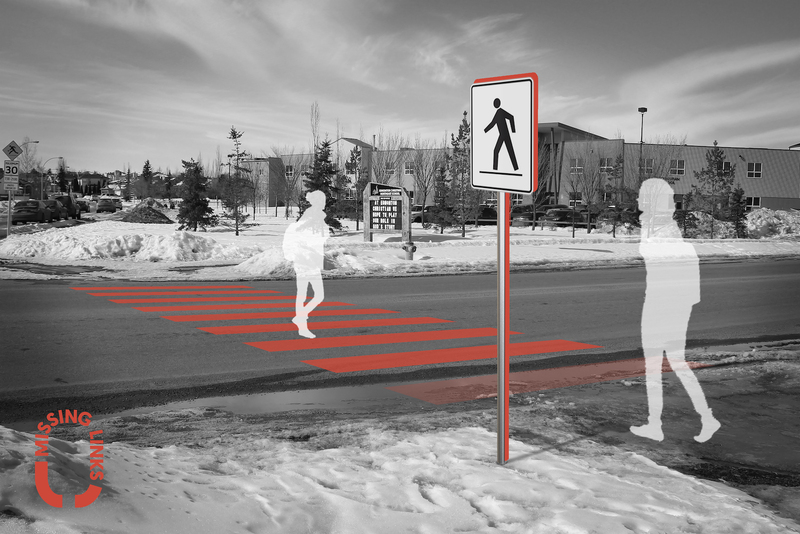 This would eliminate passing and also reduce the road width and likely marginally reduce speeds at the crossing. To make vehicle speed consistent with the 30 km/h playground zone speed limit, install a speed hump near the cross walk. 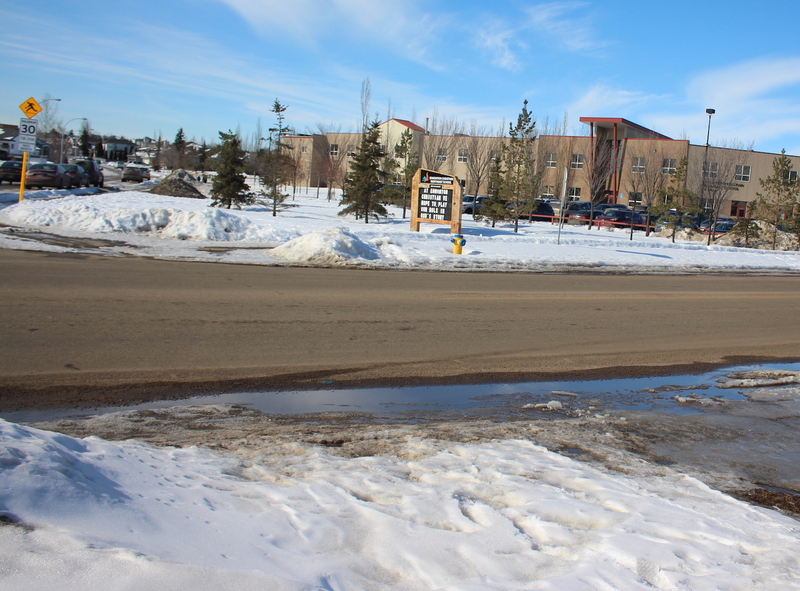 The total distance from 83 Avenue to Saskatchewan Drive is about 500 metres. 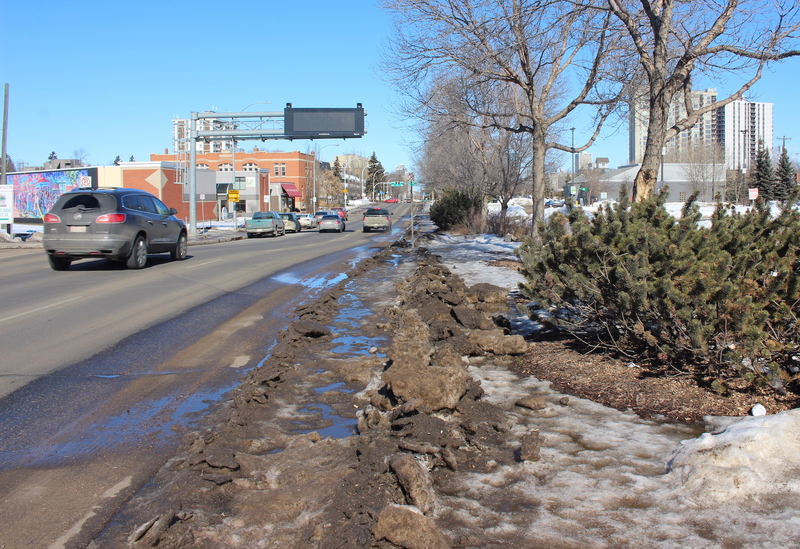 The City’s rehabilitation plan covers off about 130 metres, leaving a gap of about 370 metres. Desire lines indicate people are already using this space to walk. It is surprising that the rehabilitation plans did not include a sidewalk in this area where there is evidence of use. Fencing and lack of crossing, restricts residents movement and access as well as cutting off the pedestrian route to Borden Park. 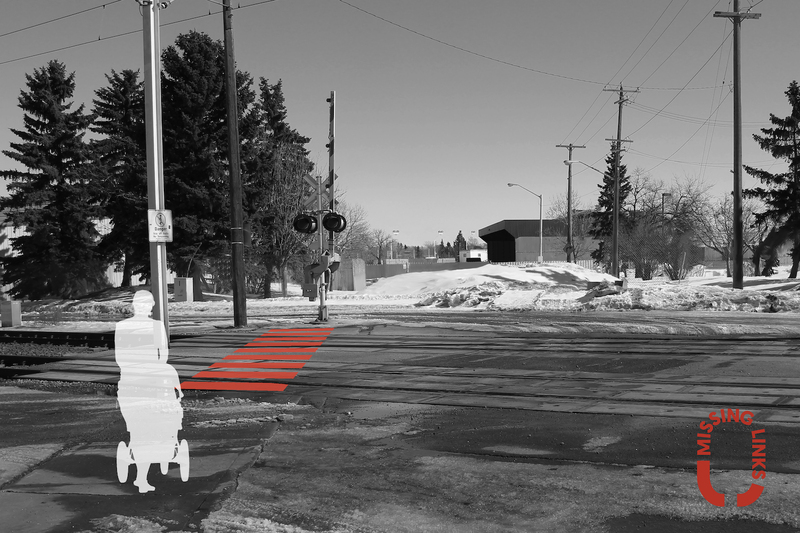 Modify the LRT warning signals, if necessary. 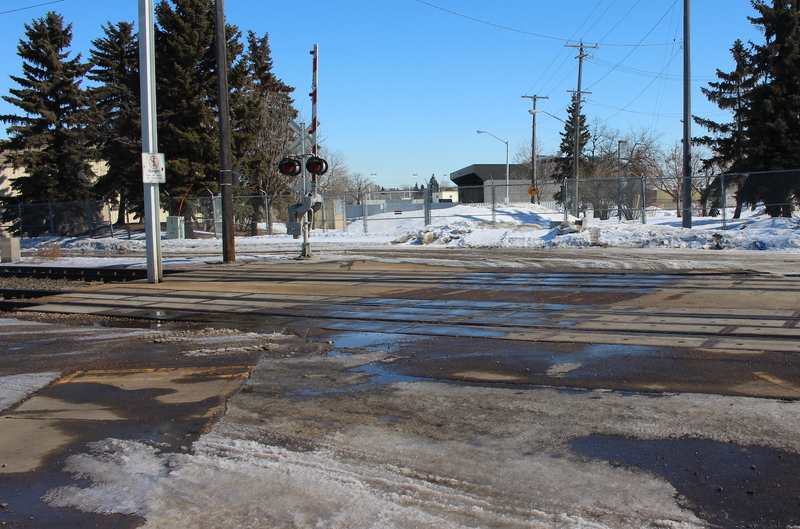 Pedestrians should be aware of LRT signals and their meaning, but if the City feels it necessary to ensure a crossing arm control over the tracks, pedestrians could be channeled to cross at the gates using a low barrier. 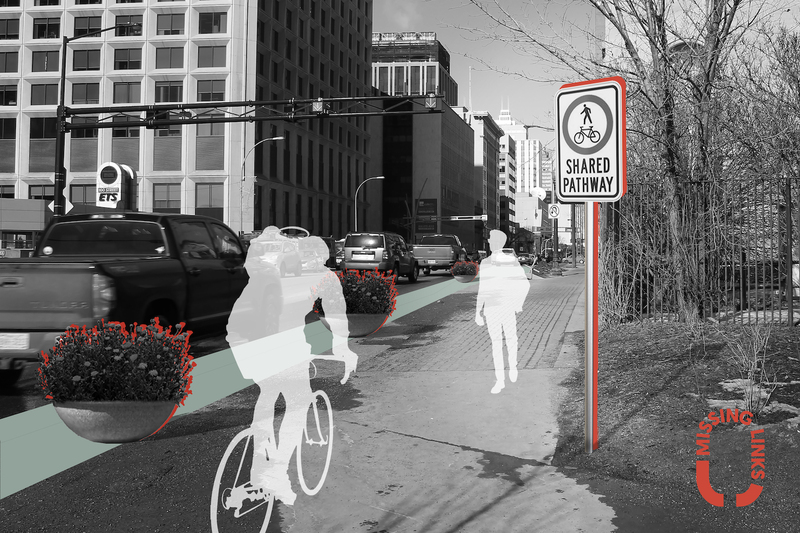 Edmontonians continue to share gaps they face in active transportation infrastructure from sidewalks to crosswalks and bike lanes. You agree with Paths for People publishing your Missing Link suggestion on Google Maps, the P4P website and social media and any resulting reports.